Nebraska Engineering student Ethan Krings and alumni Chris Volle, Matthew Mahlin and Justin Green were part of the team that developed a boom that would be used in space to support a flexible solar panel. 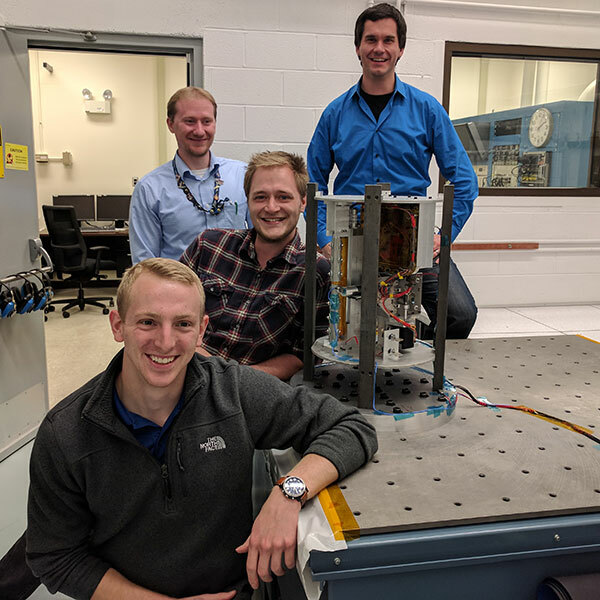 A space tool developed by Nebraska undergraduate engineering students is on its way to NASA's Langley Research Center for its first structural test before being launched on a suborbital rocket in spring 2018. The student engineering team has been working on the project since August 2016, with some students devoting 20 hours a week or more on the device to enable satellites, rovers and other space vehicles to stow and deploy a lightweight boom to support a flexible solar cell panel. The boom, its deployer, electronics housing and solar panel array were shipped to Virginia on Oct. 12 so that they can be displayed on a vibration testing table during an Oct. 21 open house celebrating Langley's centennial. The vibration test will take place in the days following the open house.